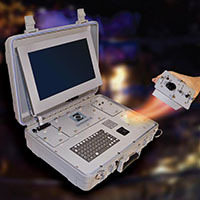 Testing Platforms are support systems used to operate testing equipment packages and to collect data. Collected below is information on Olson Instrument's range of platforms focused upon stress wave analysis, these systems can be used for thickness and quality evaluation, foundation investigations and a variety of geophysical test. 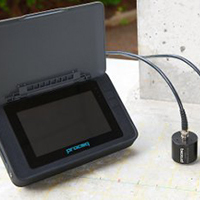 The world's most rugged, battery powered instrument for non-destructive evaluation of civil infrastructures, geophysical surveys, and general testing or data acquisition. Sonic and Seismic Testing. 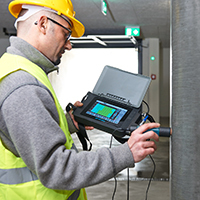 The NDE 360 is the smallest and most flexible non-destructive evaluation platform for quality assurance and condition assessment in the world. Used for Sonic Tests. The Pundit Touch screen is compatible with a range of Direct Transmission UPV transducers, P-wave, S-wave and exponential style. 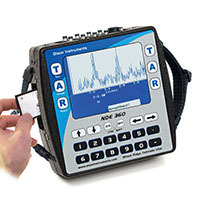 It also support Ultrasonic Pulse Echo Testing. The Profometer is a most capable cover meter system, suitable for basic scanning or mapping and diagramming rebar layouts. The same control system is also able to read Half Cell Potential Data.